Home prices were up 0.5 percent month-over-month in January on a seasonally adjusted basis, rising to 6.0 percent year-over-year. The South Atlantic Census division fared well with a 1.7 percent month-over-month increase. The Middle Atlantic Census division placed last in all divisions with a 1.0 percent month-over-month decrease. According to the latest report from the Federal Housing Finance Agency (FHFA), home prices were up 0.5 percent month-over-month in January 2016 on a seasonally adjusted basis, rising to 6.0 percent year-over-year. @FHFA: January 2016’s HPI is up 0.5% month-over-month on a seasonally adj. basis. The South Atlantic Census division, which includes Delaware, Maryland, District of Columbia, Virginia, West Virginia, North Carolina, Georgia and Florida, saw the biggest home price gains with a 1.7 percent increase month-over-month and an 8.9 percent increase year-over-year. @FHFA: South Atlantic Census division’s HPI is the best, with a 1.7% month-over-month increase. The Middle Atlantic Census division, which includes New York, New Jersey and Pennsylvania, was the only division to have a dip in month-over-month home price gains. Homes in those states experienced a 1.0 decrease in month-over-month prices, and only saw a 1.7 percent increase in year-over-year prices. 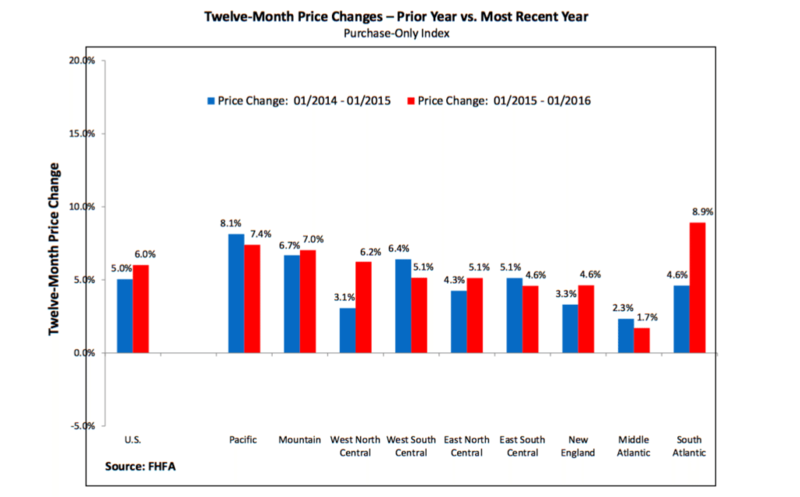 @FHFA: Middle Atlantic Census division hit hardest, 1.0 decrease in month-over-month prices. In addition to reporting January’s House Price Index (HPI), the FHFA cited a change to its December 2015 HPI report. It originally reported a 0.4 percent month-over-month increase, which was later revised to 0.5 percent. @FHFA: Correction to Dec. 2015 HPI, 0.5% month-over-month increase instead of 0.4%. The FHFA uses mortgages sold to or guaranteed by Fannie Mae and Freddie Mac to calculate the monthly HPI.